For Cleveland native Chris Peplin, wrapping Beautiful Garden signified the end of production for a project driven by a goal: make a feature length film by the time he celebrates his 30th birthday. He’ll do it — with time to spare. Along with his creative partner, Charles Moore, Peplin worked on a story and budget. They estimated they could make Beautiful Garden for $60,000 and went searching for investors — film lovers willing to promote the independents. They knocked on doors; they got their money. Beautiful Garden tells the story of an eclectic clan of runaways, artists, and drifters who take up residence in an abandoned house. Their utopia eventually becomes ingrained with greed, hypocrisy, and corruption. It was inspired by a story Peplin read about a squat house in London. Even though the script took months to write, last minute surgery on the story resulted in a script that was essentially rewritten in about a week. He credits his intimate knowledge of the characters to allow these rapid changes while maintaining an effective story line. The willingness of local suppliers was a big boon to getting the right equipment for a decent rental fee according to Peplin. In Northeast Ohio, it’s a bit of a magical enterprise to be producing a feature film. Rental houses accustomed to the banality of commercial and industrial videos were inspired to help the independent filmmakers and thus willing to go the extra mile to make it happen. You won’t see this New York or Los Angeles. Peplin also points out that your network as a producer and director can have financial benefits. He has effectively called in many favors from the people he has befriended over the last few years; equipment acquisition is one example of the strength of a well-woven network. Throughout the shoot, technical issues and scheduling tangles took front seat as they do with any film production. Eighten days of production was scheduled for fall 2010. Major electrical problems at the location house slowed things substantially. They shot for two weeks and then unexpectedly broke for two months. This break also gave Peplin the chance to look at budgeting issues and secure a bit more funding in order to wrap in the black. During production, Peplin often found himself micromanaging the set because of the limited staff and the level of experience the budget could buy. Despite sleepless nights and burgeoning stress levels, he managed to keep things moving by staying cool. Completing Beautiful Garden was a huge goal for Peplin. He understands that small projects like this are the gateway to larger budget films. Securing distribution and selling the film would fulfill another important need: getting money back to his investors — quite realistic when you’ve only spent $60,000. Under the umbrella of their production company, Peplin and Moore have several projects in development for the future, with their next film, Madtown, slated for production in mid March. They plan on making substantial investments in cameras and other equipment. He’d like to focus on directing and producing while collaborating with Moore on stories and creative concepts. Peplin comments that his love of Cleveland will be a huge factor in keeping production local. This hometown pride not only strengthen Cleveland’s filmmaking clout, but also paves the way for budding future filmmakers, actors and crew. Peplin is not shy when dispensing advice to camera wielding greenhorns. He points out the notion that since film is art, there isn’t anything to learn. Nothing could be further from the truth. 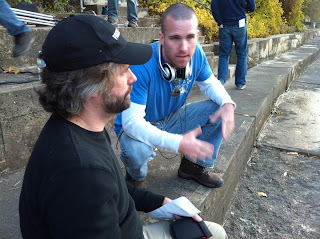 Peplin admits that he has learned more on set than in any classroom, but he recognizes formal training as a natural part of the filmmaking experience. Yes, there have been scores of successful filmmakers without a diploma, but there is a premium for the artist with a diverse background. In addition to his education at The New York Film Academy, Peplin has attended numerous workshops and seminars. While he values the classroom component, he asserts the importance of getting out there and shooting something.